Don’t throw those vegetable odds and ends into the compost bin just yet. They’re a kids’ science experiment waiting to happen! Follow the instructions below to get started with a few common veggies. No matter which you choose, be sure to rinse it well, change the water every few days, and then transfer it to a pot with soil once the roots grow. Sweet Potato Cut a potato in half and submerge the bottom half in water. (You may want to insert toothpicks to suspend it over a glass.) Roots and leaves should appear in about two weeks. Beets Cut about half an inch from the top, leaving the greens attached. Trim the greens so there’s just about a half inch of stem. Place the beet top in a shallow dish of water. Shoots should appear in a few days. Celery Trim a bunch of celery a few inches up from the bottom. Place in a shallow dish of water. Roots and shoots should appear in about a week. Green onions Cut the tops off leaving the white bulbs. 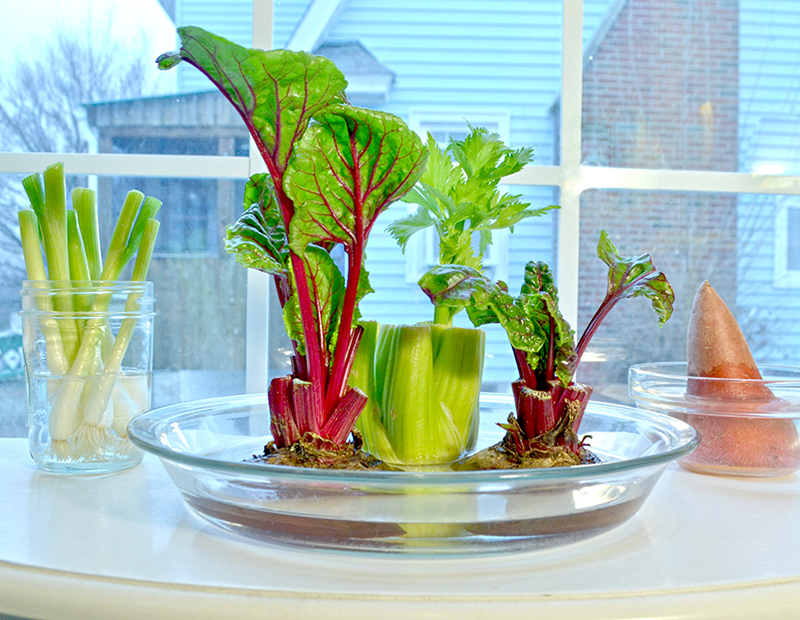 Submerge them in water (just the bottom half), and you’ll have new sprouts in a few days. They’re fast! Encourage the kids to track their plant’s growth with our printable plant journal pages. And when they’re ready for more, try growing plants from seeds!